Sweet, innocent, Barry is on a double date to introduce his mates to his new girlfriend, Alex. But there's one problem - she's a mentally unstable, drug-dealing, violent, con-artist scumbag - and he's blind to all of it. Now it's up to his friends Sarah & Anthony to save him on the craziest double date ever. In 2017, I sat down with actress Adrianne Gullotta, a good friend of mine who wanted a comedy scene for her showreel and together we searched online for a good example. We wanted something funny, fast-paced and punchline-driven. We found a few, but most of them involved two males screaming at each other. Upon further research I began to learn it was extremely hard to find a female-led comedy film that was not a chick flick. That’s crazy! This inspired me so I set out to create a comedy short with a female character front-and-centre that could appeal to mainstream audience of mixed genders. Taking inspiration from my favourite modern comedic actors - Seth Rogan, Will Ferrell, Nick Kroll & Jason Mantzoukas, I crafted the most wacky, ridiculous story I could think of, listing the most shocking and craziest things that could happen on a double date. I set it in one location to shoot over a weekend with some friends I had previously worked with and the magic began! I took advantage of this opportunity to challenge myself and try as many new things as I could as a filmmaker. 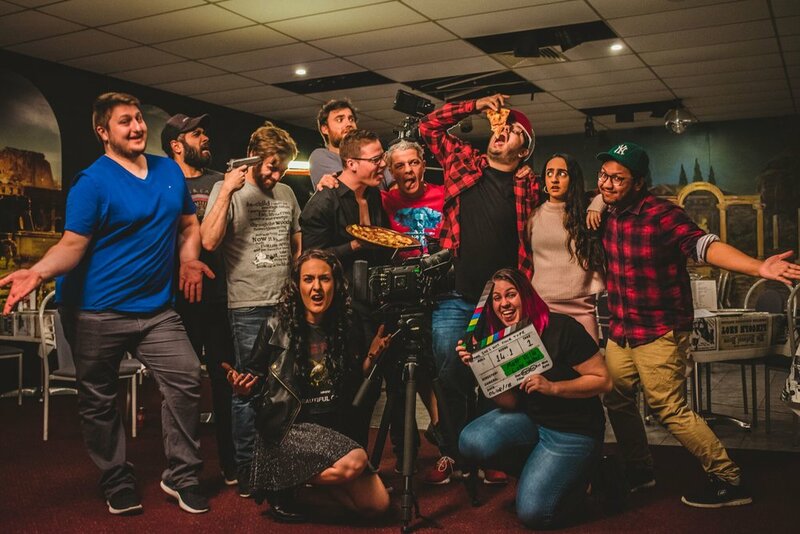 We played around with improv and alternate jokes & takes, we shot it as a multi-cam shoot, I directed a child for the first time and I even gave my acting debut performance! I’m always trying to create short films inspired by the big Hollywood stuff that I seldom see at film festivals. I’m still yet to see a character focused, fast-paced, punchline-driven short in the style of my favourite American blockbuster comedies at a short film festival. I’m proud of what my team and I have achieved with She’s Not Your Type (2018). It’s funny, edgy, unique and a strong representation of my comedic voice and I hope audiences will laugh along with this stupid, ridiculous comedy short. You can learn more about writer/director Matthew C. Vella at his official website. Learn more about our cast & crew by checking out our credits on IMDB here! Bleeding Backs is a gritty, short action film also by Matthew C. Vella. Learn more here! Matthew C. Vella is a filmmaker, podcaster & entertainer from Western Sydney. Learn more over here!